Barry Gray has been pondering his future at Solitude for a few weeks. Cliftonville have confirmed the club has parted company with manager Barry Gray. It followed Saturday's 3-1 Danske Bank Premiership defeat at Dungannon. Gray's former player at the Reds and Warrenpoint Town Daniel Hughes hit a hat-trick for the Swifts. 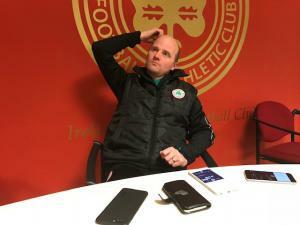 Cliftonville have slumped to six defeats in the past seven games including a Tennent's Irish Cup exit, also against Dungannon. 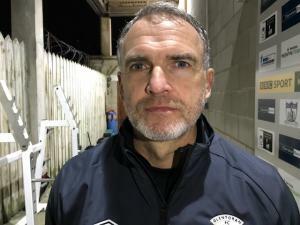 Newry businessman Gray succeeded Gerard Lyttle at Solitude in May, 2017. After losing to Coleraine in the Irish Cup final last season, he took the north Belfast club into Europe via a play-off final victory over Glentoran. Also on Saturday, leaders Linfield beat Crusaders 1-0 at Seaview - Jordan Stewart with the early goal. The Blues stay three points clear of Ballymena who were 2-0 winners away to Glenavon. Glentoran came from behind to clinch a 2-1 victory against Newry City at the Oval. Warrenpoint were the top scorers, beating their visitors Institute 4-0. Alan O'Sullivan and Lee Duffy both struck twice.